The Free Schmidt! campaign is an effort to raise awareness about the wrongfully imprisoned. It’s modeled after one of the storylines in Lisa Lutz’s book The Spellmans Strike Again, published in March 2010 by Simon & Schuster. When someone asks you “Who’s Schmidt?”—and believe us, they will—please spread the word about the Innocence Project and its work on behalf of the unjustly imprisoned. One storyline in The Spellmans Strike Again centers around the teenage P.I. Rae Spellman’s efforts to overturn the conviction of Levi Schmidt. In the book, Rae creates a grass-roots campaign to raise awareness about Schmidt—including the Free Schmidt! t-shirts you see here. 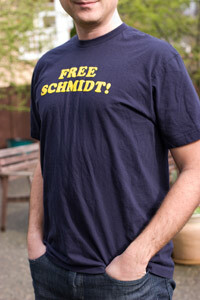 We hope the Free Schmidt! explosion helps to get more people thinking about wrongful convictions—and ultimately inspires people to get involved in the Innocence Project. Find out more about the book. Please pass this site along to friends, find out more about the Innocence Project. Oh yeah, and Free Schmidt! © 2013 Spellman Enterprises Inc.